The Age of Stupid (Director: Franny Armstrong): I’ve been following the story of this film for more than a year now and was glad to finally be able to see it last night at the Canadian premiere. The Age of Stupid is unique because the creators have used the Internet to crowdfund the making of the film, and they’re doing the same thing to distribute and promote it. This Huffington Post article applauds the filmmakers for engaging with the audience directly and using social media tools to accomplish a lot on a limited budget. Even if they film was simply mediocre, the amount of work they’ve put into spreading the word will contain lessons for many filmmakers trying to get their films seen without the backing of a major studio. Luckily, the film is far from mediocre. Essentially an environmental documentary, what sets The Age of Stupid apart is its clever framing device and brilliant editing. Pete Postlethwaite stars as the archivist, a lone figure watching over a collection of the earth’s greatest treasures in a building high above the Arctic sea. The year is 2055 and he’s looking back at video evidence of the environmental degradation that we could have avoided. As he accesses and moves clips around his screen, he wonders mournfully why we didn’t do anything to avoid this catastrophe. In this way, director Franny Armstrong can show us several different documentary threads within a (science) fictional framework. The editing is slick and the way in which some of the segments are ordered makes for a powerful and thought-provoking viewing experience. For instance, one of the threads follows Indian entrepreneur Jeh Wadia as he attempts to launch a low-cost airline in India. He sees his mission as beneficial, allowing all Indians access to cheap air travel. But in some of the other segments, we learn that the greatest contributor to greenhouse gases is air travel. It’s going to be very difficult to convince people in the developing world to give up things that we have taken for granted for many years. Another affecting story is that of French mountain guide Fernand Pereau, who has watched the glaciers in the French Alps melt over the past fifty years. His mournful 82-year-old face has seen a lot of “progress” and as he says, we know quite well how to profit from the earth, but not to protect it. Even those who are working for change are coming up against obstacles. Piers Guy is working to expand the use of wind power turbines in the UK, but he faces opposition everywhere from people who don’t want the turbines to “spoil the view.” His frustration is palpable and is being played out all over the world. In fact, the film itself doesn’t really offer a lot of solutions, but it does do a good job of expressing the all-encompassing nature of the problem. Luckily, the filmmakers have partnered with many organizations who are working for change, and have established another website, NotStupid.org which will serve as a constantly evolving resource for action. 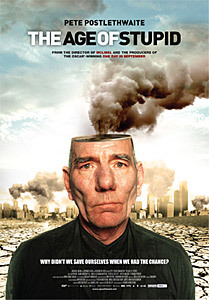 The film also uses animation to take on such wide-ranging topics as resource wars and consumerism. I can see this being a must-see for students, and much less dry than An Inconvenient Truth. Even the title hints at the ample humour in the film, even if it is just to reiterate how stupid our behaviour has been. I’m also impressed that the filmmakers have made a huge effort to have the film shown in every country in the world. In fact, the Global Premiere is taking place over two days, September 21st and 22nd. This guarantees worldwide media coverage and might even help the issue of climate change reach critical mass in the collective consciousness of the humans on an ailing Planet Earth. Note: Last night’s Canadian premiere was sponsored by the Climate Action Network who recommended that people sign the petition at KyotoPlus.ca. Another good resource is tck tck tck. The film will have its first public screening in Toronto on Saturday October 3rd at 6:30 at the Royal Cinema as part of the inaugural M.U.C.K. (Movies of Uncommon Knowledge) Film Festival. This entry was posted in Documentaries, Theatrical Release and tagged climatechange, environment. Bookmark the permalink.